What I really, really like about the new TWD-generation is that we often also bake savory stuff. I used to make a lot of bread some years ago and forgot why I stopped. 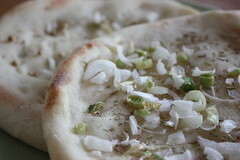 These Oasis Naans are really good. I prepared the dough the day before. It didn't rise a lot in the fridge - maybe more yeast is needed. But nevertheless I arrived at making 4 pieces (I made only half the recipe). I played around a bit with the spices and made one with each: rosemary, coriander seed and nigella. I made them in the morning and had two of them for breakfast - what a great way to start the day! They are not a big fuzz, and are very short in the baking (about 10mins - my oven stops at about 450° so I left them in a bit longer), so perfect for making them just the moment before you eat them. The one with nigella was an experiment, but turned out the best of all. 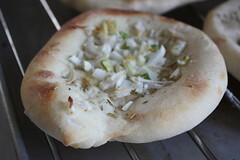 I will definitely make them again, and use more scallion the next time! For the recipe, have a look at Dorie Greenspan's book "Baking with Julia" - the recipe is on pp. Or turn to this weeks host's blogs: Maggie of Always Add More Butter and Phyl of Of Cabbages & King Cakes. Looks great! I never heard of nigella other than the author/cook. Learn something new everyday. I know we were supposed to dock them to stay flat, but I think I like the look and texture of the puffy parts best! I like the different spices that you tried out.